FAQ - Which tint is right for me? Help to decide which screen tint to pick for your bike. 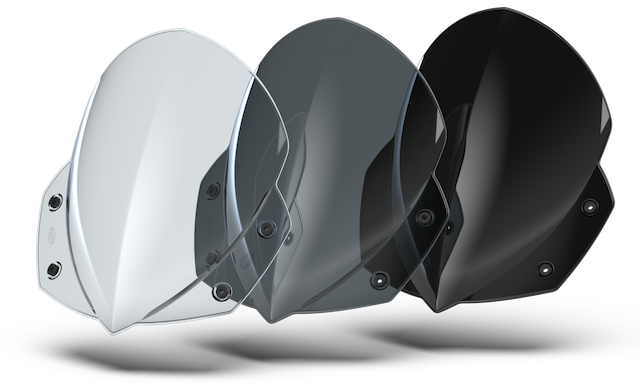 Light: The standard and original Light tint, optically clear and the most functional. The Light tint allows the rider to see though the screen under all conditions and has the most minimal impact on changing the aesthetics of the bike. Dark: The midpoint between the light and midnight screen, it still holds some of the functionality of being transparent, but has a larger impact on your bikes aesthetics. The recommended screen for darker bikes, as it can tidy up the front end while protecting the instrument panels. 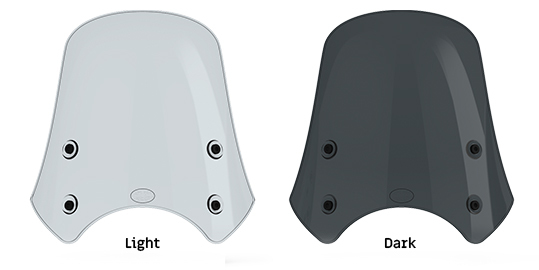 Midnight: The biggest impact in terms of styling, the midnight black is for those riders that are looking for a screen for their dark themes bikes or for those who are looking to completely hide their instrument panel behind the great styling of the Dart flyscreen. Having a hard time deciding which screen to choose? Why not check out our buyers guide to make sure you make the right decision.